The product provides the energy necessary to perform the effort and lost during your workout! High-quality carbohydrates enriched with L-arginine to provide maximum support to your body during training! Excellent choice for both endurance and endurance athletes! The successor to Olimp Carbo® - the best carbohydrate product last several years. Even better enriched composition! Olimp Carbonox ™ is based on carefully combined carbohydrates sources, selected according to precisely defined profiles of the rate of digestion and release of sugars into the bloodstream. Laboratory-selected proportions of carbohydrate sources with high (glucose) and medium (maltodextrins) and low (innovative isomaltulose of extended release) glycemic indexes ensure the stable saturation of the blood components of energy for a period of two hours from the moment of the preparation. Olimp Carbonox ™ during most important moments ... YOU WILL NOT LACK ENERGY! The universal application - to meet the needs of the most demanding: before after and during exhausting training! The universality of the composition makes Carbonox ™ can be successfully used both in training and during it, constituting a continuous source of energy for continuing long-term sports. The high content of isomaltulose and maltodextrins ensures maintaining insulin levels during exercise, stable, guaranteeing uniformly effective supply of the working muscle cells with the necessary energy ingredients. 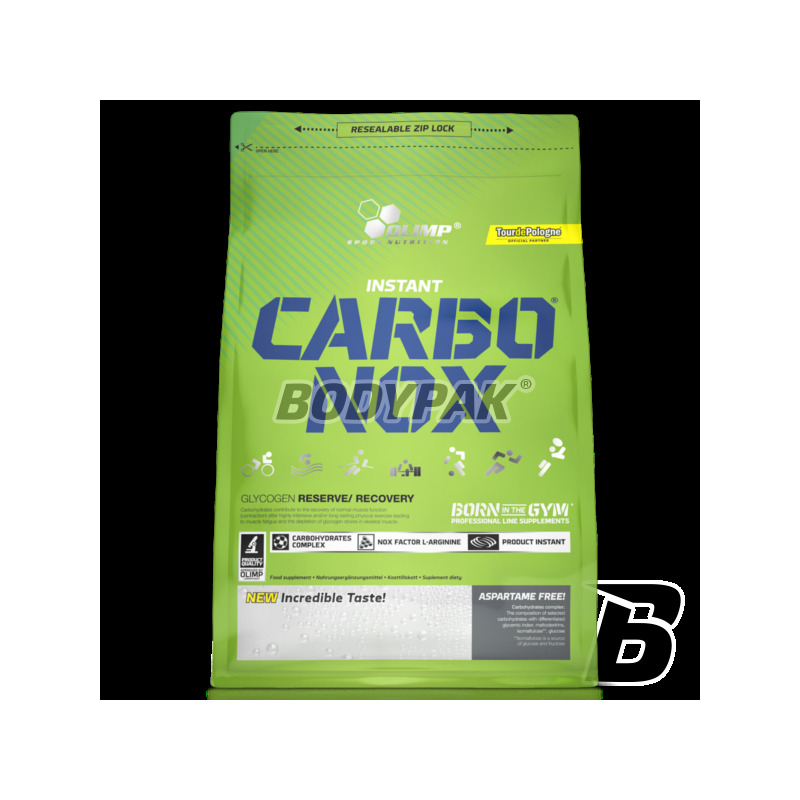 Carbonox ™ - unique composition based on the most effective carbohydrate sources. The idea of ​​using the Olimp Carbonox ™ complex carbohydrate formula is also based on the idea as soon as possible and optimally high saturation of blood with monosaccharide, so necessary after exhausting training. The use of isomaltulose of extended release results in more effective regeneration of glycogen resources, as released during the decomposition of glucose and fructose, in total, more effectively rebuild muscle and liver glycogen. Olimp Carbonox ™ is also enriched with L-arginine, which serves as a substrate for the synthesis of nitric oxide (NO). A complex of as many as 12 vitamins from all major groups substantially increases the absorption of carbohydrates and intensifies the metabolic transformations. In addition, the high antioxidant capacity disclosed by some of the vitamins stops the training damage to structural proteins of muscle cells, accelerating at the same time, at the molecular level, their regeneration. Olimp Carbonox ™ is recommended for anyone practicing a sport (amateur and professional), and can be successfully used in most sports. 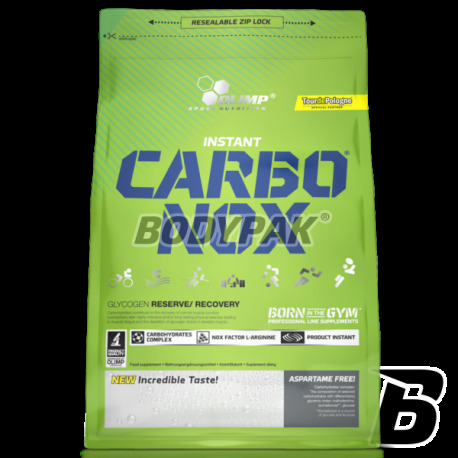 Carbonox ™ particularly recommended for individuals undergoing intensive physical exercise. The product provides the energy necessary to perform the effort and lost during training. Olimp Carbonox ™ is the best composition of energetic ingredients - carbohydrates with differing particle sizes: maltodextrins, fast-acting glucose and innovative isomaltulose ** sustained release; enriched with essential vitamins, including vitamin B6, which helps to maintain normal glycogen metabolism, as well as minerals and L-arginine, which serves as a substrate for the synthesis of nitric oxide (NO). Contained in the product vitamins (B1, B2, B3, B5, B6, B7, B12, C) and minerals (iron, manganese, iodine) contribute to the maintenance of normal energy metabolism. The product provides the energy necessary to perform the effort and lost during training. Which products combine the best Olimp Carbonox ™? In order to maximize the growth of muscle mass, this product after training can be combined with protein supplements such. Mega Strong Protein ™ or Whey Protein Complex 100% ®. In order to increase the effectiveness of your workout perfect addition (used before training) will be the Creatine Magna Power®, BCAA Xplode ™, or AAKG 7500 Extreme Shot ™. 1 serving (50 g - 90 measuring units = 3 scoops or 5 flat tablespoons) dissolved in 100 ml¹ drink water for 30 minutes. before and immediately after training. Depending on the sport and exercise intensity is recommended to use from 2 to 4 servings daily. A balanced diet and a healthy lifestyle. Ingredients: 95% complex carbohydrate (maltodextrin, glucose, isomaltulose **), 1% L-arginine hydrochloride, acidity regulators - malic acid, citric acid; 1% minerals (calcium salt of phosphoric acid, calcium carbonate, magnesium carbonate, ferrous fumarate, manganese sulfate, potassium iodide, chromium chloride (III), molybdate (VI), sodium selenite, sodium), flavors, 0.1% vitamins ( L-ascorbic acid - vit. C, ethyl DL-α-tocopheryl - vit. E, nicotinamide - niacin, D-biotin, retinyl acetate - vit. A, D-pantothenate - pantothenic acid, pyridoxine hydrochloride - vit. B6, cholecalciferol - vit. D, folic acid - folate, thiamine mononitrate - vit. B1, riboflavin - vit. B2, cyanocobalamin - vit. B12), sweeteners - acesulfame K, sucralose, colors: carmine, riboflavin (for orange flavor), cochineal (for strawberry, grapefruit, cherry), riboflavin (for lemon flavor). ** Isomaltulose is a source of glucose and fructose.